Houston is becoming one of the choice locations for new homeowners and the projected figure for new homes expected to touch 16% in the year 2014, Texas Custom Mirrors is the one destination for all the framed mirror accessories you need. We are the premiere framed mirror store in Houston and can offer you custom mirrors in many styles and any size you might imagine. Have you been looking for beautiful mirrors for your bathroom, kitchen, or office? Contact us and we will make your dreams come alive. 1. The newest homes that are being built in Houston focus on being eco-friendly or are passive houses. These houses look for energy efficient building styles that leave a minimal carbon footprint and are very energy efficient. Using solar building materials, they aim at using the minimum of energy for heating or cooling their homes. Our framed mirrors can assist you in energy conservation by lighting up your home. You can use mirrors to reflect natural light into your home and thus reduce your dependence on electricity. Further, our mirrors can be used to diffuse light from fewer sources and light up larger rooms. 2. Families like to use the kitchen as the hub and most new homes today have open kitchens that are combined with the family living room. Use our custom mirrors to infuse a light, airy feel into your kitchen that can make it warm and inviting. Not only can you use our mirrors on the cabinet doors but you can use them on the wall behind your counter as a subtle space enhancer. If you have a wall that is placed at an awkward location, simply use one of our elegantly framed mirrors to hide it from view. 3. Builders today prefer to create flex rooms in new homes. These rooms are often built as an extension of your bedroom. They serve as a private reading room or den or simply as a personal space for you to relax and unwind. Some flex rooms are spacious enough and have their own entrances that are distinct from the rest of the house. Do up these rooms with styled mirrors that project your personality and show off your prized possessions. 4. Many homes in Houston are now being built along traditional lines and adopt styles like for example, Queen Anne’s or Craftsmen homes. Our mirrors are versatile and can blend effortlessly into any building style. Craftsmen homes often have deep porches that you can adorn with specially-crafted mirrors and create an intimate space for spending your mornings with a hot cup of tea or coffee. These homes also typically have large fireplaces above which you can place a framed mirror to offset decorative items. We also have a collection of ornate and traditional frames that will complement your decor and home perfectly. And did we mention our collection of mirrors with the perfect antique finish? 5. The bathroom is another important area of new homes. People use spa baths and Jacuzzis for relaxation and bathrooms today are more than just restrooms or shower rooms. You will find that today’s homes in Houston have spacious bathrooms that are elegantly decorated and any bathroom decor is incomplete without styled mirrors, both floor and vanity, to enhance their appeal. Use them to show off your walk-in showers or beautiful tiled walls. And of course, if your bathroom also doubles as a dressing room, mirrors are indispensable. We, at Texas Custom Mirrors have all this to offer and so much more. Trust us to take care of all your decorating needs. Visit our store in Houston for mirrors and check out the amazing options we have for you. We are confident you will find just what you’re looking for. Texas Custom Mirrors is the premiere framed mirror store in Houston.Have you been looking for beautiful framed mirrors for your bathroom, kitchen, or office. 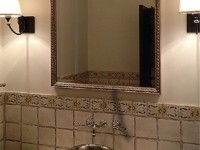 We offer custom mirrors in many styles and any size you might imagine.